Beginning with his first major Hollywood production, Alfred Hitchcock began a familiar formula within his films which made for countless successes. He very often used ordinary people, put into what he called extraordinary situations. In the case of The Man Who Knew Too Much, Leslie Banks stars as the ordinary man and title character. Once discovering a plot for a political assassination, an otherwise average man is thrown into a thrilling case of international intrigue. The recently released biopic about Alfred Hitchcock is primarily focused on the risks that he took when making the film Psycho, which essentially started the slasher genre and changed the direction of horror pictures forever more. This was certainly an interesting point in Hitchcock’s career, but mostly because it was later on in his career and many thought that his best pictures had already been made. The truth is, even from this first Hollywood production, Hitchcock was not afraid to take risks. One of these risks comes in the casting of the film’s most memorable villain, Abbott (Peter Lorre). This would be Lorre’s transition into English-speaking roles, though it came at a time of desperation. Although Lorre was an admired and respected actor after M, the war had put a hold on a film career in Germany. The Man Who Knew Too Much was a saving grace for Lorre’s career, and a risk that paid off well for Hitchcock. So much so that it is hard not to miss Lorre most of all in Hitchcock’s admirable second attempt at this film decades later. 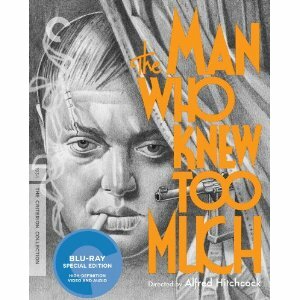 The Blu-ray release for The Man Who Knew Too Much includes a new digital restoration of the film, with uncompressed monaural soundtrack. There is also an optional audio commentary with film historian Philip Kemp and a new interview with fan and filmmaker, Guillermo del Toro. Archived material includes a 1972 interview with Hitchcock and audio excerpts from Truffaut’s legendary interview from 1962. There is also a short featurette with a restoration demonstration and a booklet insert featuring an essay by critic Farran Smith Nehme. Tim Burton once had a tumultuous relationship with Disney, though you would never know it from his recent ventures. In his younger days Burton was a bit too edgy for Disney, and he didn’t enjoy what little work he did with them. The main reason that The Nightmare Before Christmas was released through Disney was the fact that he had come up with the concept while working there, thereby contractually giving Disney ownership. These days Burton has become a much milder filmmaker, able to make films like Alice in Wonderland with Disney. It comes as little surprise that he adapted one of his early short films into a feature-length with them as well. 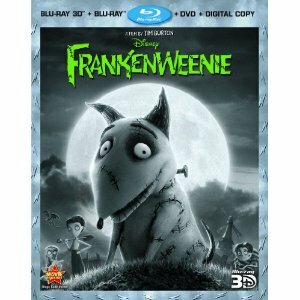 Frankenweenie tells the tale of a boy who loves his dog so much that he brings him back from the dead. It is a clear claymation adaptation of the classic black-and-white Frankenstein from the 1930s, and borrows from several others along the way. Burton even goes so far as to film the entire movie in black-and-white, a bold choice for animation in the days of Pixar and technologically advantages. The countless classic film references are sure to keep adults entertained, while the younger audiences can experience the classic tale for the first time. In what clearly appears to be one of Burton’s more self-autobiographical films, Frankenweenie’s protagonist is a young aspiring filmmaker named Victor, who uses his dog Sparky as the star of his monster pictures. When an accident occurs, taking away Victor’s only friend and pet, a science experiment brings Sparky back. It also sets off a series of events that result in a series of monsters being unleashed on the town. The Blu-ray 3D package includes four discs; Blu-ray 2D, Blu-ray 3D, DVD and Digital Copy. The four-disc combo pack also includes a number of exclusive special features, most notable being an all-new short film featuring Sparky. The DVD special features include a look at the exhibit traveling the world comprising of the film’s artwork and models from the film’s production. There is also a music video. The Blu-ray has these features, as well as a tour of the London sets from the film’s production and the original live-action short film that inspired this movie. I’m not certain if there are more of these martial arts epics made in China than any other genre of film, or if these are simply the ones most exported to the United States, but either way we seem to have a new one on Blu-ray every other week. Sometimes it becomes difficult to distinguish between them, as many have similar plots and easily forgettable action sequences. Although The Assassins is not the most original or memorable film to be released, it is one of the better ones made in recent years. The action is spectacular, choreography and cinematography working together to make many memorable sequences. The characters are also complex and well constructed. My only criticism would be directed at the film’s unwillingness to commit entirely to one character for inspiring sympathy from the audience. While trying to create an array of emotions, the filmmakers stretch this attempt too far and eliminate most sympathy from the distance created by so many characters complexly weaved into the story. Though there are many unnecessary additions to the story, the focus quite clearly remains with Ling Ju (Crystal Liu Yi Fei), a female warrior trained since childhood alongside many other children. Though Ling is in love with fellow child soldier Mu Shun (Tamaki Hiroshi), this must be put aside for the mission they were trained for. 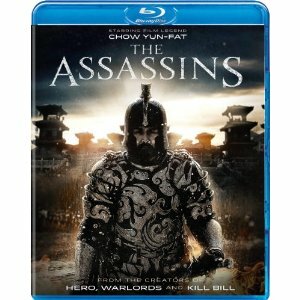 After ten years of preparing, they are sent to assassinate the most powerful man in the world, Cao Cao (Chow Yun Fat). The reasons behind the assassination are much more complex than the emotional melodrama of Ling Ju and Mu Shun, but unfortunately their story is placed in the background and the family drama behind the assassination attempts is revealed. As often is the case, there is some historical accuracy to the assassination attempts and the historical characters in the film, though I actually would have preferred more from the characters who were quite clearly fictional. There is a love story at the center of this film which is dismissed quickly into the story, which is disappointing considering how strongly the film begins. The action remains solid throughout the entire film, though there are large portions which remain focused on the espionage of betrayal instead. The Blu-ray includes a behind-the-scenes featurette and a trailer, but it is the visuals of the fights in high definition which makes this package worthwhile.